On the flight from Detroit to Paris, I met Jim Hocking, founder of Water for Good, who travels to Africa to drill water wells. I shared how my students read A Long Walk to Water by Linda Sue Park and how they were shocked by the lengths that some young people must go to in order to provide a basic necessity for their families. He gave me a bracelet that says "water=life." I’ve been wearing it during this trip, and as the time in my host city comes to a close, i find myself thinking about what it is that equals life here in Fkih ben Salah. Salah drove four hours to drop us off and pick us up. Adil came with him and we had a nice lunch together. Family. Our host teacher and dear friend Salah, welcomed us as part of family. His wife fed us and his children played with us. When we visited his oldest sons school, he ran up to me and gave me a huge hug. His mother always greeted us warmly and sat with us, even though she did not speak English. They did not just invite us this week, they invited us forever. I know that when I return, there will be a warm meal and cookies waiting for me. As we headed back to the capital, we were welcomed by friend Adil to his school. The students sang for us and even baked us cakes. Hospitality. I find it hard to explain just how much the people of Morocco go out of their way to make you feel comfortable. The manager of the Hotel Ifrane was patient with the idiot Americans as we bumbled with Google translate French to talk to him. The sandwich guy at the grocery store always greeted us with a smile, a handshake and attempted to speak English for our benefit. And the schools. The teachers of English at Salah's school, Tighnari High School, put together a cultural celebration, complete with musical performances of "Hotel California" and "Zombie," sketches, and speeches, of which we were the guests of honor. Salah spent hours driving us to sites such as a Marrakech and Ozoud waterfalls so we could shop and see the countryside. He even hiked with me to get a better view. After a three hour drive to deliver PD to a group of teachers in the mountains, we were surprised to discover that one of the teachers had made lunch for us in her home. Even on our last day, we found ourselves at a celebration in a country school where the students sang and cooked for us. And tea. Everywhere we went, we were received warmly with tea and cookies. This is Merieme Achmerk. She will change the world. Powerful Young Women. The female students we met are ready to take on the world. Another young woman, the host of the cultural event at Tighnari, was able to command a large audience of her peers with grace and humor. Merieme Achmerk delivered an emotional performance of Ms. Nobody that shook the building and stirred my soul. And earlier that same day, we watched her deliver a speech to her peers, written as an assignment on why she should be elected principal of the school. Both of these women, plus many others, make me hopeful for the future. Life in Fkih ben Salah is tied to many things. I often find myself overcome by emotion. Emotion for Morocco, emotion for the Moroccan people, emotion for the experience. Even now, as I drive down the mountain and watch the sunset, I look as far as I can into the horizon and know that 6,000 miles away the three pieces of my heart are waiting. Peace. It seems fitting that this post should be written on my son's 5th birthday - a day celebrating growth and love. Those are the two words I would use to describe this journey so far. Growth, for me as a human. Love, for the love of the Moroccan people. There are three thoughts I'd like to share about this first week in Morocco. Panel discussion at ENS, where we learned about their teacher preparation program and shared our own experiences. These pre-service teachers can't wait to begin their careers! Students at Lmssalla High School put together poster projects, one of which was a compare/contrast of American and Moroccan youth. Can't say they were wrong! 2. Kids are kids. These kids are stellar. Most speak 4 languages fluently. They study advanced mathematics and sciences. They are children of faith. But at the end of the day, they are on Instagram and SnapChat, playing Fortnite and hanging out with friends. They are passionate about education and safety. One student expressed her sympathy for the Parkland shooting and another had strong views on changing textbooks to better reflect the lives of students. Most looked no different from my kids in California. Although, I did love this one display of how they viewed American youth. 3. People are people. Although these people might be the best people. Their hospitality knows no bounds. I know without a doubt should I travel back to this country I would have a place to stay and people to look after me. Even though we are different in many ways, we share a common love of life and the human experience. To be welcomed into someone's home, to be fed and loved, is a joyous occasion. I can only imagine what visiting my host family in Fkih ben Salah will be like. 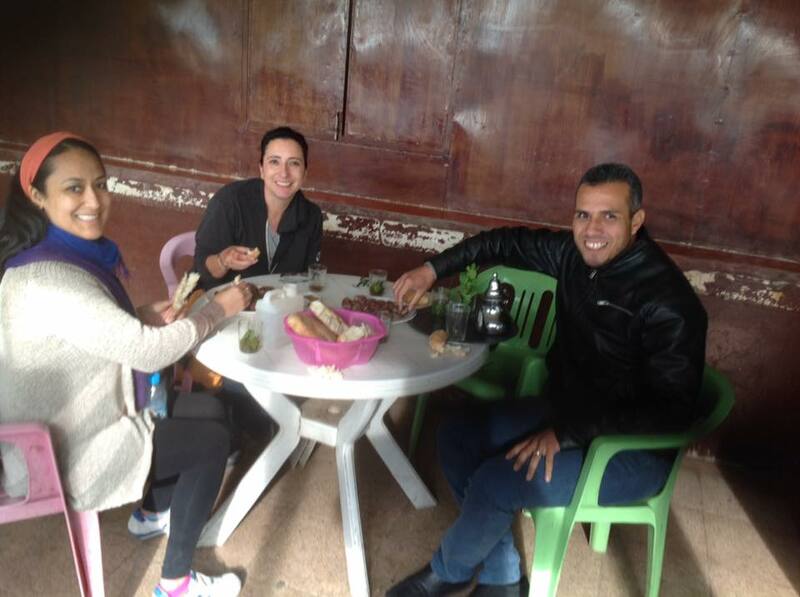 Our host, Meriem Lahrizi, took us to her family's country home for a meal. Her father showed us how he makes tea. And then scared Maria half to death by pretending to drop her cup when he handed it to her. I laughed SO hard. And I am off! My travel partner, Maria Zavala and I leave shortly for the next leg of this amazing adventure. Until next time, enjoy some photos. Peace. In Meriem's backyard, a little chilly, but beautfiul sky. The library at Moulay Youssef HS had books from the 1920's! We took a sunset stroll through the Casbah in Rabat. Maria and I at MACECE, the Moroccan American Cultural Exchange Commission. This mosque was right on the ocean. And windy. Session on best practices in the backyard. Decompressing with my friends Rhett and Ashlee. I got henna from a Lmssalla student. Exquisite detail at the mosque. I spent most of my spare time in the spring of 2014 looking for a way out. I had been teaching 8th grade for 8 years, and was feeling restless. I Googled all variations of “what to do with a master’s in education outside the classroom” I could think of. My husband and I went so far as to discuss a move to northern California for a PhD program. Finally, one of my searches brought me to a leadership opportunity that changed my life and career. It allowed me to stay in the classroom and also explore the wider world of educational policy and leadership, of which I was not aware. Fast-forward 3 years and the list of “education stuff outside the classroom” I do is extensive. It all started with the Hope Street Group National Teacher Fellowship. I applied on a whim, I only came across the opportunity 2 weeks before the application was due. I was stunned when I received word I that I was a finalist and even more stunned when I was accepted. With this fellowship, I learned about education policy, how to be a change agent from the classroom, how to work with policymakers big and small and how to communicate my message. I was connected to the most incredible, accomplished group of educators in the country, who to this day remain my bedrock of support. It was the opening of this door that allowed the floodgates of opportunities to be unleashed. From Teach Plus, to Teachers for Global Classrooms to NCTE Policy Fellow to my advisory roles for the Gates Foundation, Better Together CA, and on the board of directors for EdReports, I now see my role as both a teacher and policy leader. I wanted to share some opportunities for California educators that are interested in learning about or expanding their leadership lives. I promise, you won’t regret it. Below are just a few suggestions. Want more? Check out my blog from my time in DC as a NCTE Policy Fellow. As a fellow, I worked closely with colleagues across the state to build legislation around teacher lay off policies. They provided messaging training, as well as opportunities to visit Sacramento and meet with policymakers. Through this fellowship, I learned about California education policy and contributed to legislation that is currently being evaluated. This program, through the US State Department, was a 10-week graduate level online course on global education- everything from what is global education to writing lessons. After the course, I traveled to Washington, DC for a symposium on global education, and the experience culminates with travel abroad to deepen understanding of cultural concepts. If this interests you, also check on the Fulbright Distinguished Awards in Teaching Programs which offers 3 to 6 month programs abroad of study inquiry. A great way to grow as a professional and develop leadership skills is as an educator reviewer for EdReports. EdReports offers free reviews of K-12 instructional materials. They pay and train their reviewers to evaluate English, Math and (coming soon) Science materials so districts and teachers can make the best selections for their students. The organizers behind the annual Better Together: California Teachers Summit create year-round opportunities for teachers to connect with and learn from one another. Follow @CATeacherSummit on Twitter and use #BetterTogetherCA to join in on monthly twitter chats, hosted by California teacher leaders on topics suggested by their peers. Teachers in the network are also able to write blog posts (like this one) and participate in the annual Summit event as EdTalk speakers and Edcamp session facilitators. Visit www.cateacherssummit.com to learn more! Becoming a board certified teacher is a great way to improve your practice and take your teaching game to a new level. I loved the experience and feel honored when I say I am an NBCT. Are you a K-12 educator in the STEM fields? Want to spend 11 months in DC working in a federal agency or congressional office? Then this is the right opportunity for you! This opportunity brings educators from across the country to the US DOE to become involved in the development and implementation of national education policy. It is open to teachers, principals and other school staff members. Before I begin my tour of the museums here in DC, I want to take a minute to extend my utmost gratitude to a few people. First, the NCTE team in the DC office, Jenna Fournel and Lu Ann McNabb, for being gracious and welcoming. I will miss our little office camaraderie. Second, my family. I was able to have this incredible experience only because of the support of my amazing mother-in-law, who came down to DC to watch the kids for three weeks, and my sweet parents, who flew out for grandparent duty for the remainder of the time. Finally, my darling husband, who has been alone at home with a screaming cat for more than a month. My deepest thanks to you all. It’s tough to explain to a twelve-year-old the sheer power of words. Ironically, words don’t do themselves justice. As I made my way around the sights in DC, I found myself constantly in awe of the words all around me and the ways in which they have shaped, and continue to shape, our country. Below is a collection of my thoughts, lesson ideas, and reflections on five museums, in the order in which I viewed them. As a teacher of The Diary of a Young Girl, the Holocaust is a topic I discuss with eighth graders every year. The main exhibit experience begins with a large group of people packed into a steel elevator, which makes you instantly uncomfortable. When you exit, you are met with videos taken during concentration camp liberation and a giant photograph of burnt corpses. The silence in the museum is overwhelming. Two areas in particular spoke to me. The first was the section on propaganda. This year I would like to have students analyze the rhetoric of Joseph Goebbels to answer a couple of common questions: Why were people angry at Jewish people? How did Goebbels use words to confuse and deceive? The second section I found interesting was about the League of German Girls. During our unit study, we cover Hitler Youth, but I didn’t know about its female counterpart. Finally, I have tried researching contemporary genocides in the past, but I would like to revisit that this year. The USHMM website has a rich library of educator resources, including a couple of interesting professional learning opportunities. I uncovered a few neat ideas. Most important is Wonderplace, a super awesome play space complete with a climbing structure, a kitchen with fake fruit, and the Spark!Lab, where kids can be inventors and make stuff. Kiddos were happy for hours. The exhibit Many Voices, One Nation made me think, How do the words of many people, across time, unite to form a country? I could have my students look at the works of the authors we study—Edgar Allan Poe, Richard Wright, Daniel Keyes, and whoever else gets tossed in there this year—to see how each of their unique voices became a part of the narrative of America. Life imitating art. The exhibit had cute interactive elements. I’ve been a fan of these guys since I met them at NCTE’s Annual Convention in 2014. I’ve used their incredible resources for teaching Shakespeare, and they also offer professional learning opportunities, including a month-long stay here in DC to study Shakespeare in depth. Of course I had to visit! The current exhibit showcased paintings of Shakespeare, the man himself and the scenes from the plays. The library is home to the largest collection of Shakespeare works, as well as other rare Renaissance works. Since I took the tour, I got to peek in the reading room. Swoon. During the tour, our guide mentioned that Shakespeare was not wholly original and that he took many of his stories from other authors. How can words be refashioned into something new and exciting? On an unrelated note, while at Folger I enjoyed learning about Project Dustbunny, dirt from the gutters of books analyzed for past readers’ DNA—wild. The abolitionist newspaper The North Star was founded by Frederick Douglass. My kids will love seeing the actual paper. Alongside the reading of Black Boy, my students and I read the Narrative of the Life of Frederick Douglass, an American Slave. A question for my students will be, How can we use words to fight for change? This question will be especially useful as we follow Wright on his journey of discovering how authors used words to fight racism. The California paper posted outside the day I visited. This exhibit poses the question, What freedoms do students have at school? And now I, NCTE’s 2017 Kent B. Williamson Policy Fellow, am signing off. I hope you enjoyed following along as much as I enjoyed the journey. Please contact me; I’d love to connect and chat. Peace. This week I dive into writing a policy brief, discover the realities of standardized assessment, and try to wrap my head around starting the school year. This week I visit a teacher preparation program, talk about global education with the departments of education and state and visit my California Senators. This week kicked off with Senate meetings. We met with staffers from both Republican and Democratic offices to urge the Senate not to eliminate Title II funds (so you can still have access to professional development) and to protect the $189 million for LEARN (intervention support). Both sides were sympathetic to our concerns, but it's clear that they are contending with budget cuts. There is a cap on non defense discretionary spending, and it has seen a significant drop. Staffers from both sides of the aisle said that if we want to protect these funds, then raising the cap is essential. What does that mean? At its essence, it is akin to giving me a budget of $20 to feed my family of four each month. It's just not possible, and certainly not healthy. Food is a critical part of life. I need to raise the cap on my budget in order to prevent my kids from starving. The same goes for Title II and LEARN, two programs critical to quality education. We should not be forced to cut these necessary programs. NCTE issued a press release later in the week expressing deep concern about these proposed cuts in the House appropriations bill. On Tuesday I went with NCTE's Lu Ann McNabb to the House Committee on Education and the Workforce hearing on ESSA state plans. The Democrats were vocal about the lack of representation from the Department of Education, and wondered when Secretary DeVos would appear before the committee. The Republicans voiced concerns about the department's recent feedback on state plans and felt it was overreaching. Chairwoman Foxx was clear in stating that the committee will watch to make sure DC "keeps its distance" in regards to ESSA implementation. Outside the hearing room, there was quite a line, which started at 8:30 a.m. for the 10 a.m. hearing. I chatted with doctoral students from Texas A&M while we waited. Wednesday I was invited by rock star teacher leader Anna Baldwin to attend the Convening on Systems of Support for Excellent Teaching and Leading at the US Department of Education. The Ambassador Fellows worked this year to create a framework that "allows states, districts, and schools to assess the alignment of their systems of support for teachers and leaders to a set of core principles." Participants spent the day collaborating and providing feedback on the framework. Keep an eye out for the release of this tool. I know I am looking forward to sharing with my administration and strategizing ways we can improve our professional learning. Jason Botel, acting assistant secretary for elementary and secondary education, offered closing remarks. He stated that he sees ESSA as an opportunity to tailor education programs to the students. He also recognized that the work is hard, and teaching is hard. I couldn't agree more! Taking my work seriously! Photo courtesy the Department of Education. We participated in a gallery walk activity where we offered feedback on each team's vision on the framework indicators. Photo courtesy the Department of Education. Jason Botel spoke genuinely about being a teacher and his passion for making sure teachers feel empowered. At the end of the week I was able to spend some time with my ASCD Teach to Lead team at L2L. This past year, Meghan Everette led a team which consisted of myself, Danielle Brown, Jason Flom, Kenny McKee and David Griffith to determine how educators view their role in advocacy and what can be done to better support potential advocates. The results of this research can be found at the Hurdles and Hopes website. The purpose of the L2L session was to engage with the results of the study. We discussed advocacy barriers and ideas for removing those barriers. I particularly enjoyed crowd-sourcing ideas for professional development modules around advocacy. The room was full of leaders who had strong ideas on how to improve educator advocacy. Meghan Everette: If only there were words. Meghan is a Hope Street Group alum, ASCD Influence Leader, co-creator of the #EdAdvBecause chat, and an ASCD Emerging Leader class of 2014. She is also a Scholastic blogger (so check that out) and all-around super mom and amazing human. Anna Baldwin, Amanda Barney, Monifa McKnight, Dana Nerenberg and the US Department of Education School Ambassador Fellowship: All of these magnificent ladies are ambassadors. It was great seeing fellow Hope Street Group alum Anna, and fellow EdReport's crew Dana. Amanda was an excellent facilitator and sounding board, and I had an invigorating intellectual discussion with Monifa. Jennifer Briones: I met Jen when she worked for Hope Street Group. Now she is a Policy and Advocacy Associate for Data Quality Campaign. She was kind enough to help me with my research project while I am here. Angela Brizuela and the Library of Congress Summer Teacher Institutes: Teaching with Primary Sources: Angela is a STEM teacher at my school, El Rodeo Elementary. She was in town for the week at the Library of Congress for a teacher institute (check out the site, they have other options that cover all teachers.) This particular institute gathered a consortium of educational partners in an effort to develop curriculum using primary sources from the Library of Congress. Angela had high praise for the event: "I found the institute to be enriching in that I was able to develop science curriculum that was interdisciplinary and encourages critical thinking which is vital to developing responsible citizens." Greetings from Washington, D.C. I thought I would start by introducing myself. My name is Lauren Stuart and I teach 8th (and soon 6th) grade ELA for the Beverly Hills Unified School District. I am honored to be this year's National Council of Teachers of English Kent B. Williamson Fellow. What does that mean? As a way to honor Kent Williamson's dedication to teacher leadership, NCTE established this fellowship which allows a member to come to D.C and be immersed in education policy. Each week during my stay I will share my experiences with you. Also, you can follow along daily on Twitter @laurenpstuart. The week began with a training from the McKeon Group on both education policy and NCTE’s priorities. I was reminded that the actual policymaking process is nothing like the textbook version. Remember this guy! Love him, but the process is not so simple. NCTE is asking Congress to support: ESSA’s Title 1, $190 million for LEARN, and student grant and loan programs, as well as protect Title II funds. If you would like to contact your representatives to discuss these priorities, let me know and I will help you make contact. My second day brought me together with NCTE's esteemed Executive Director, Emily Kirkpatrick as we traveled together to sit in on the National Council for the Social Studies Summer Legislative Institute. We share the same concerns! Our colleagues have proven that social studies is relevant, needed and wanted by our students, and yet they must constantly convince decision makers to fund their programs. Participants visited their legislators, and most had positive responses. If you know a social studies teacher who would like to get involved, encourage them to join NCSS and attend their annual convention this year. On Thursday I attended "School Vouchers and Segregation" at the American Federation of Teachers headquarters. The Center for American Progress released a paper on this topic, and brought together a panel to discuss. Congressman Bobby Scott (D-VA) opened the session by stating that research shows that vouchers negatively impact student achievement. He urged the government to support public schools and not divert funds to private schools. Justin Reid from the Virginia Foundation for the Humanities told the story of Prince Edward County, and how their students came to be a part of the class action lawsuit that became Brown v. Board of Ed. What I didn’t know, was that as a result of the verdict, the Board of Supervisors decided to shut down the school for five years instead of integrate. Kids went 5 years without an education. In addition, white students were given tuition grants to attend private schools, which led to segregated schools. Also in attendance was Catherine Lhamon, the Chair of the Commission on Civil Rights. She called for a promise from the federal government to ensure simple justice, civil rights for all students. This section will highlight people I met while in town, as well as opportunities I come across. Luella is a fellow Californian, who was here for the NCSS SLI. I loved chatting with her about her interest in Native American studies, and being a studio teacher. Returning to the classroom after a long weekend can be tough. Returning to the classroom after a long-term absence, such as maternity leave, can be stressful for both the teacher and the students. Below I have some tips on making the transition smooth for everyone, especially the babies left at home. If I could talk about literature all day, I would. Seriously, I would sit at a cafe with a chai for 8 hours and just talk books. Naturally, I was excited to start the Literary Essay (Argument) unit of the Units of Study in Writing program by Lucy Calkins. Having just finished the Investigative Journalism unit, the students were now familiar with the Writer’s Workshop format. While the overall experience was positive, there are some important notes for anyone tackling this unit for the first time. The common text: We had just finished reading the short story version of Flowers For Algernon, so I decided to use that. I don’t know how wise this was. By the end of the third essay, the students were sick of writing about it. First a thematic essay, then an author’s craft essay, then a comparative essay - over the span of about 8-9 weeks. It’s a little long to be spending with one piece for 8th graders. Next year, I might try to do use a different common text for each essay. That would mean probably one novel and two short stories. Choose wisely in Bend II, as there is a symbolism exercise! Homework: Often the homework would ask for the students to bring in an essay plan. They had no idea what that was, so I said, “You know, an outline.” Yeah, not so much. I recommend the first time you give this instruction to offer a template or examples on what this should specifically look like. E-notebook v. paper notebook: I was blessed with the introduction of Chromebooks this semester, so most people moved to a google doc notebook. This brings its own set of hiccups, but I found it best to stay out of technical conversations. I relied heavily on, “Find a friend to teach you how to do that.” Worked like magic! Counterargument: Here is where the controversial element comes in: Does the literary argument include counterargument? UoS says yes, most of my colleagues say no. The real issue: it is incredibly difficult to teach an 8th grade how to write a counterargument for a thematic statement. Checklists: The checklists are extremely complex for writers who are unfamiliar with this program. I parred down to only a few items per essay for them to focus on. I also had to help them unpack the language, since it was hard for my students to understand. So we are in the home stretch! One more unit to go, which is Position Papers. My students love to argue, so this one should be fun. Check out this piece I wrote for Teaching and Learning 2016. 35 pairs of eyes stared at me expectantly. A classroom of thirty 13 year olds sized me up, deciding whether the new 8th grade English teacher was easy prey. Having not taken a single teacher preparation class, I tried my best not to panic. I wasn’t even really a teacher yet. I was a University Intern who felt ill equipped for this pivotal moment, my first day as an educator. Teachers entering the profession today are facing a massive achievement gap, highly diverse student populations, more rigorous standards, and an ever-changing political landscape. It’s essential that we take serious steps to help our new teachers navigate this complex profession. As a National Board Certified Teacher, I keep in mind Core Proposition 5 and take responsibility for assisting my learning community. Therefore, along with 17 other Hope Street Group National Teacher Fellows, last fall I conducted peer research on the issue of teacher preparation. We held focus groups and online surveys, gathering the voices of nearly 2000 U.S. teachers about what they needed for effective teacher prep. While my experience as a University Intern, working full-time as a teacher and attending a Master’s/credentialing program after school, is certainly unusual, my experiences do mirror many of the concerns I heard during my focus groups. One key finding from the research — published this week in “On Deck: Preparing the Next Generation of Teachers” — specifically addresses this concern: “Teachers emphasized the importance of hands-on classroom experiences, especially when serving high-need/persistently low-achieving populations.” My first day I walked into a school where the population was 97% free and reduced lunch, neglect at home was commonplace, and the harsh realities of urban life often clashed with their desire to learn. I had no idea how to begin to teach these kids anything, let alone something as integral as reading and writing. Teacher candidates need robust in-classroom experiences to truly prepare for the day-to-day challenges of a career in teaching. What can I, and others like me, do as a current classroom teacher? Host and work with pre-service teachers. Current classroom teachers can help prepare the next generation of teachers by offering support aligned with the issues outlined in our report. This can include assistance in unpacking new college- and career-readiness standards and how to effectively work with low achieving populations. While my district currently has no partnership with an Institute of Higher Education (IHE), I can adapt by helping those who are new to the profession. Teacher retention was key to many teachers I spoke with, and we should be ready to help new teachers early and often. Connect with your local IHE. Even if hosting a pre-service teacher is not an option, there are still ways to be involved. Reach out to your local IHE, and see if there is a way to share your expertise. Invite pre-service teachers in for observations, or offer to present about your experience as a teacher. Advocate for the profession. Organizations such as Hope Street Group, NBTPS, ASCD, VIVA, ECET2 and E4Eare excellent ways to get involved. These groups, and so many more, can help position you at your state and local levels to take part in these important conversations. Teachers should be engaged at all levels; district, state and federal. Want to start the dialogue now? Join the conversation about teacher prep on Facebook or Twitterusing #TeachersOnDeck. If you are attending Teaching & Learning, Hope Street Group fellows and NBCTs Freeda Pirillis (Illinois) and Amanda Ward (Washington) will be presenting a session about this research on Friday, 3/11 at 8:30 a.m.: “Teacher Prep: Reflections from Classrooms.” We look forward to seeing you there! There is nothing more exhilarating than being surrounded by thousands of English teachers, who are just as eager to learn and connect as I am. This is my second year attending the National Council for Teachers of English Annual conference #NCTE15. It is currently 27 degrees here in Minneapolis, which is tough to stomach since my husband is in cargo shorts and flipflops since it is 80 degrees back home in Los Angeles. However, due to the sprawling skyway system, I haven’t had to go outside. . . yet. I wish the story had a happy beginning. I woke up bright and early for my 8 AM session, ready to begin my now familiar journey through the miles of skywalk from my hotel to the Minneapolis convention center. To my horror, the skywalk was closed and I was forced to walk outside in 16° weather. I clutched my Starbucks, flipped on my fuzzy hood, and trekked the whole mile like a big girl. I’m glad I did. Today’s sessions were incredible, I couldn’t choose just one. Here are the highlights from the five I attended. In the interest of time, I have chosen one salient point for each presenter. If you would like more information on the presentations or links to materials, send me a message and I will be happy to pass those along. I sit in the back of my room, with 28 thirteen-year-olds huddled around me. The stale, summer air is thick with beginning of the year nerves. They are squished together, with pencils at the ready, for our first day of writer’s workshop. It’s new to them, it’s new to me. Some are rapt with attention, eager for a challenge. Others are wary of change. My goal? To improve writing instruction in my classroom.